Windy conditions greeted participants in the Hunter Junior AFL Grand Finals on Sunday at Tulkaba Park, Teralba. In all, eight grand finals were to be decided, with a spread of clubs represented across the two fields. In the Under 12 Girls decider, undefeated Nelson Bay took on Warners Bay Red, who had come from third place in the Home and Away season to reach the decider. The experience of the Nelson Bay side showed on the scoreboard, coming out 31 point winners, however the Warners Bay side were persistent in their attack on the football, however were unfortunately unable to turn pressure into points. Nelson Bay’s Sarah Gray was judged best on ground in a dominant display across the ground. The Under 14 Girls match saw a tight first half, with scoring proving difficult. Newcastle City however were able to pile on the goals in the third quarter with the aid of a strong breeze, kicking four goals to break the match wide open. Try as they might, Maitland could not utilise the breeze in the fourth quarter, with the previously undefeated Saints side tasting defeat for the first time all season. London Ashcroft was outstanding for Newcastle City, picking up the best on ground medal for her efforts. The Under 17 match was also an entertaining match, with the Cardiff Hawks side able to use the wind effectively to kick away to a seventeen point win. Interestingly, both sides were only able to score with the breeze, while Cardiff’s victory was built on keeping Nelson Bay scoreless in the 2nd quarter when the Marlins had the aid of the breeze. The Marlins refused to quit however, dominating the final quarter to come within striking distance of the Hawks when the final siren went. Arizona Cross from Cardiff was dominant in the midfield and was justly rewarded with a best on ground medal. In the Under 11 Giants division, Lake Macquarie capped off an undefeated season with a twenty two point win over the Newcastle City C team. Joshua Kellehear was dominant for the Dockers, and received the best on ground medal. For the Dockers, the ability to consistently hit the scoreboard throughout the four quarters proved to be the difference, with the ability to score into a strong wind being the deciding factor. The Under 11 Swans division saw the top two teams battle it out. Maitland were victorious over Newcastle City A by a single point in the home and away season, with the grand final rematch promising to be an equally entertaining affair. Maitland were able to speed out of the blocks, racing to a ninteen point lead at quarter time. From there though, Newcastle City A were able to apply the brakes, whilst evening things up at the half time break. The second half was all Newcastle City A, with the Blues able to to run away with the match, despite the efforts of a gallant Maitland side, headed by Abrahm Russell, who was adjudged best on ground in a losing side. The Under 13’s match also featured Newcastle City & Maitland, with similar expectations, given the top two finish of the teams involved. Unfortunately for the Saints, it was all Newcastle City, with the Blues running out convincing winners. Newcastle City were well served by Asher D’Arcy who picked up the best on ground medal. The effort of the Maitland side could not be faulted, however Newcastle City were simply too strong on the day. The Under 15’s match promised to be an entertaining affair, with the third placed LMS Rockers taking on 5th placed Cardiff. Both sides won through to the decider in dominant fashion, taking out the fancied first and second placed teams. The scoreboard was not a true reflection of the closeness of this match, with Cardiff able to convert their chances better in a 35 point win, with Damien Haynes leading his team to victory in a best on ground performance. 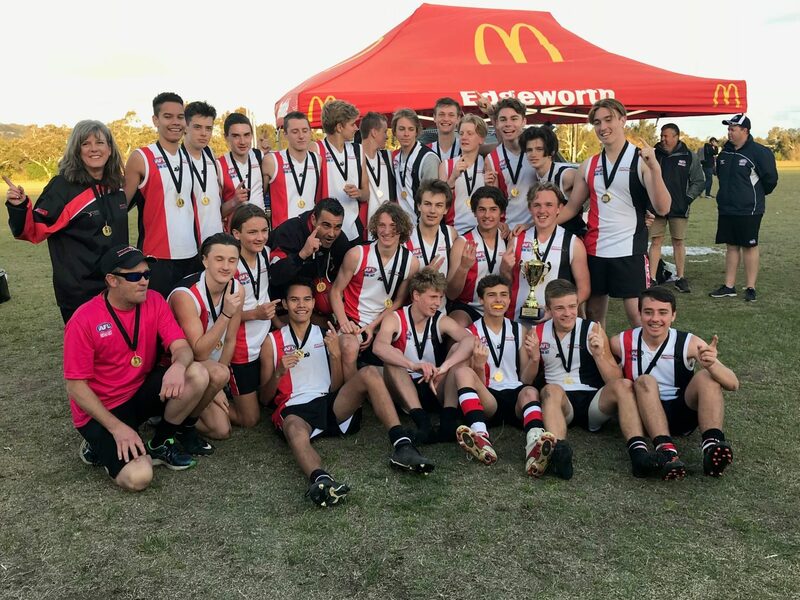 In a highly skilled affair, the Terrigal Avoca Panthers were able to overcome a determined Newcastle City outfit in the Under 17’s decider. The ability of both teams to score into the breeze was a feature of this match, with Newcastle City never quitting in their pursuit of the Panthers. Oscar Baker was outstanding for the Panthers, picking up a best on ground medal. With many players in this match graduating to senior football in 2019, both clubs will be surely in good hands if the skill level on display in this match was any indication. Finally, the Lake Macquarie Dockers AFC deserve a hearty thanks for their efforts in hosting such a busy day. With eight premierships decided over two grounds, the volunteers at the Dockers were able to again put on a magnificent event.